Evolution of cooperation: Russian anarchist prince Peter Kropotkin and the theory of mutual aid. Darwin’s publication of On the Origin of Species sparked major battles. The most famous may have been between science and religion, but there were disputes within science as well. One of the most heated was whether natural selection favored cooperative or competitive behaviors, a battle that still rages today. For almost 100 years, no single person did more to promote the study of the evolution of cooperation than Peter Kropotkin. Kropotkin traveled the world talking about the evolution of cooperation, which he called “mutual aid,” in both animals and humans. Sometime the travel was voluntary, but often it wasn’t: He was jailed, banned, or expelled from many of the most respectable countries of his day. For he was not only the face of the science of cooperation, he was also the face of the anarchist movement. He came to believe that his politics and science were united by the law of mutual aid: that cooperation was the predominant evolutionary force driving all social life, from microbes to humans. Kropotkin was also a Russian prince. A private tutor named Poulain taught him about the French revolution and smuggled anarchist ideas into the Kropotkin household, where Peter’s father put on airs about the family’s royal ancestry. Poulain also took the boy to visit political agitators in Moscow. In 1854, at age 12, Kropotkin renounced his title, but he was still a child of privilege. He once had a strange encounter with Czar Nicholas I at a Royal Ball, and years later Peter ended up enrolled in the Corps of Pages. Kropotkin’s father couldn’t have been happier about his son’s prospects at this elite breeding ground for Russia’s next generation of leaders. Peter, however, was bored out of his mind. “Day after day passes,” he wrote his beloved brother, Sasha, “almost the best days of life and you can’t make use of them, you simply vegetate, you don’t live.” He quickly rose to become the top student in the Corps, which also made him chief page to the Czar Alexander II (who had succeeded Nicholas I). When he wasn’t tending to the czar’s needs or taking classes, Peter spent his time doing what he loved to do most: soaking in nature’s beauty, reading about the burgeoning anarchist movement in Russia, and learning radical new ideas on evolution and natural selection propagated by an Englishman named Charles Darwin. One of the perks of being the top student at the Corps was that when he completed his studies in 1862, he had first choice of any government appointment. To the utter amazement of his friends and the bewilderment of his father, he requested an appointment in the newly annexed Amur region of Siberia. The odd choice caught the attention of Czar Alexander II, who inquired, “So you go to Siberia? Are you not afraid to go so far?” “No,” Peter replied, “I want to work.” “Well, go,” the Czar told him. “One can be useful everywhere.” And so, on July 27, 1862, he went. Kropotkin’s adventures during his five years in Siberia were the stuff of movies. He crisscrossed 50,000 miles of the region, often “lying full length in the sled … wrapped in fur blankets, fur inside and fur outside … when the temperature is 40 or 60 degrees below zero …” His job was to inspect the dreaded prisons of Siberia, full of not just criminals but political agitators. He did so dutifully, but with disgust. The border of Siberia, he wrote, should have a sign like that from Dante’s Inferno: “Abandon Hope All Ye Who Enter Here.” The rest of his time was devoted to learning more about anarchist philosophy (often from anarchist leaders who had been banished to Siberia) and, most importantly, studying the natural history of animals and humans there. He was also prepared to challenge the biological orthodoxy that natural selection led only to competition. He was still a Darwinist, and an adamant one, but he thought the process of natural selection, especially in brutal climates like Siberia, could lead to mutual aid, not only competition. His nascent ideas on anarchism and biological evolution were beginning to merge into one. After five years in Siberia, Kropotkin moved on to study at the University of St. Petersburg, where on paper his focus was mathematics, but in reality his major was studying to be an anarchist. He was good enough at it that the czar had him arrested and thrown in the Peter and Paul Prison in St. Petersburg. Kropotkin described its history: “Here Peter I tortured his son Alexis and killed him with his own hand … here the Princess Tarakánova was kept in a cell which filled with water during an inundation, the rats climbing upon her to save themselves from drowning … here were annals of murder and torture, of men buried alive, condemned to a slow death, or driven to insanity in the loneliness of the dark and damp dungeons.” Eventually Peter escaped. It was an incredible, front-page news jailbreak, involving months of preparation, spies, shills outside the prison pretending to be drunk to distract the guards, and a co-conspirator playing a mazurka on the violin as a signal to make a break for it. Kropotkin published a series of books and long pamphlets, including Mutual Aid, The Great French Revolution, Modern Science and Anarchism, and Ethics. He lectured across Europe—in the places that hadn’t banned or expelled him for being a troublemaker—and in two long speaking tours in the United States. He probably would have returned for a third tour, but after President McKinley was assassinated, anarchists were personae non grata in America. Rumors were even floated in the United States with the preposterous notion that Kropotkin was somehow linked to the assassination. By the first decade of the 20th century, two things still troubled Kropotkin about his theory of the evolution of cooperation. He had been arguing that when environmental conditions changed and mutual aid was especially useful, it seemed to take hold in a population quickly. Really quickly. So quickly that it just couldn’t be accounted for by the slow, gradual changes that Darwinian theory of the day proposed. An evolutionist through and through, Kropotkin turned to the ideas of Jean-Baptiste Lamarck, who had proposed his own ideas decades before Darwin about how evolution operates. Lamarck suggested that habits acquired during the lifetime of an organism could be transmitted to the next generation. For example, if shore birds stretched their muscles as far as possible to raise themselves up on wet sandy beaches, their offspring would have longer legs as a result. With Lamarckian inheritance, massive change can happen in a single generation. That gave Kropotkin the speed he needed to explain how mutual aid increased so quickly. Problem 1 solved. Or so he argued. Problem 2 was this: In real time, as it was happening, what prompted an animal to dispense mutual aid? Kropotkin turned to economist Adam Smith for insight. Though Kropotkin despised the capitalist system Smith had devised in An Inquiry into the Nature and Causes of the Wealth of Nations, he was enamored with an earlier book of Smith’s called The Theory of Moral Sentiments. In it, Smith made the case that humans dispense mutual aid because we mentally put ourselves in the position of those needing aid, and to “minimize our own vicarious pain” we help—we are empathetic. But Adam Smith restricted his discussion of empathy and mutual aid to humans. 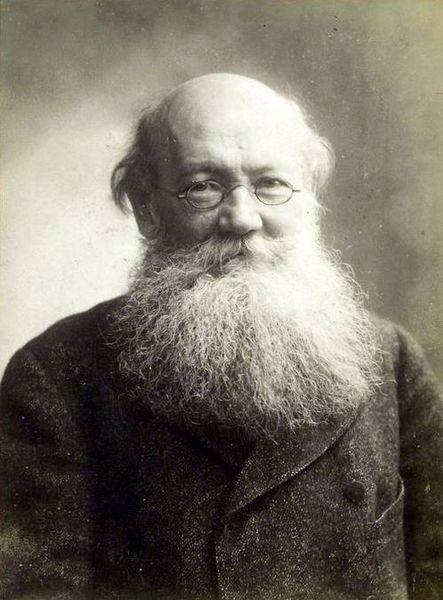 When Kropotkin lifted that restriction, he found what he needed. “Adam Smith’s only mistake,” Kropotkin wrote, “was not to have understood that this same feeling of sympathy [what today we call empathy] in its habitual stage exists among animals as well as among men.” Problem 2 solved. Or so he thought. Almost 100 years after Kropotkin’s death, what can we say about his theory of mutual aid? Well, with 20/20 hindsight, he certainly made a mistake aligning himself to Lamarck, but it was a mistake that many, including Darwin, made. And it’s still a matter of heated debate whether nonhumans show empathy. My guess is that some do, but the data are scant. But Kropotkin’s primary legacy in the sciences is that he was in the forefront of challenging the prevailing Darwinian principle that evolution was strictly about competition and survival of the nastiest. Today, hundreds of papers come out annually on animal cooperation in nonhumans, and many of these papers show Kropotkin to be something of a prophet. But what Kropotkin cared about more than anything was that understanding mutual aid in animals might shed light on human cooperation and perhaps help save humanity from destroying itself. Whether that happens remains to be seen.